Since version 4.0, you can find the small “…” button beside the targets’ id input field. 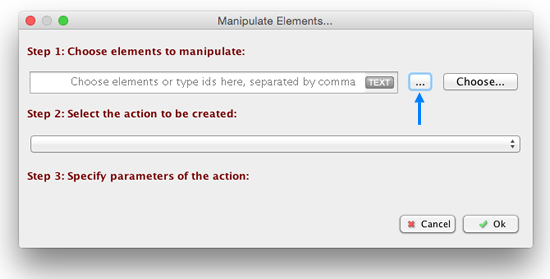 That means you can use properties to specify target elements dynamically. 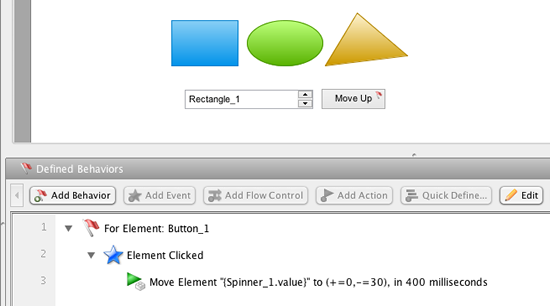 Because the target elements are not confirmed at the editing phase, only some common actions are available in this case, such as moving, resizing and show/hide elements. The target element is decided in the run-time, and the user/reviewer has the chance to specify the target element. If you replace the Spinner element with TextEditBox element, you can choose any element on the page to move. This enhancement looks very small, but it is very useful and makes ForeUI simulation more powerful. If you have ever used ForeUI before, you know how difficult it will be to implement such a scenario in older versions of ForeUI, basically you will have to predict all possible target elements and make a branch of behavior for each of them. Now with this small enhancement, things become so easy and you just need to define one line of behavior for all of them.